Create a Branded Look on All Social Media Channels: From your profile photo and cover photo to your Twitter background – every element of your social media profile should have reflect your brand. That means custom images designed specifically for each social media image specifications. 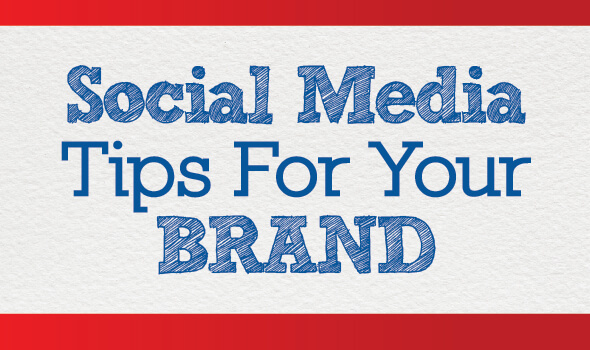 Consider your social media as an extension of your business – and that includes visual branding. Branding also acts as a giant billboard for your company. When someone “likes” or follows your page, your logo, slogan and artwork appears on every one of their friends’ newsfeeds. Link to Other Social Media Profiles: One of the simplest ways to promote your brand on social media is to engage in a cross promotional strategy between your social media accounts. That means link your accounts – and also link those accounts to your web site or blog. Every time you promote another site on yours, you create a “call to action” from one site to the other and drive new traffic. Fill in the Blanks: Every social media profile has several areas in which you can fill in content information, an “About Me” section and various other info boxes in which you have the chance to put important business contacts and information. Most businesses do not take advantage of this simple, yet effective, way to communicate important business information. A skilled social media optimization and SEO company can help you add links and ensure you aren’t missing any chances to promote your business. Know How to Boost: Social media sites such as Facebook are a great place to spread the word about your business – but you need to make sure people are seeing your posts. Boosts are an inexpensive way to promote your content on social media, through advertising or promoted posts. With social media boosts, a little goes a long way – and a social media manager can help your business create a budget, as well as compelling content that will attract new customers to your social media pages and your business. Get Visual: Perhaps the most important piece of the social media optimization puzzle is creating content that will compel viewers to stop scrolling through their newsfeed and pay attention. Visual posts that feature product images, quote graphics and infographics are extremely powerful. The average social media user only spends two seconds skimming a posts before deciding to engage, but studies prove that an eye-catching visual causes viewers to pause and take in the message. Visual social media graphics are also highly shareable, with the power to gain viral traction. To get the best social media results, it’s a smart move to make an investment in the best social media marketing company. Noxster is an LA SEO company and social media optimization company with a proven record of delivering top search social media results. Noxster combines expert search engine optimization tools with a keen understanding of how people interact and engage with social media. Noxster helps your business or organization create a dynamic social media strategy that translates into increased business visibility and new customers or client leads.